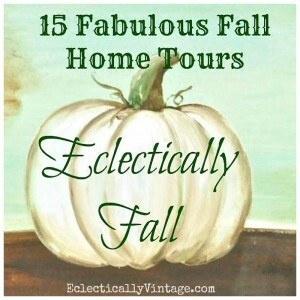 I’m so excited to be a part of the 2015 Fall Home Tours hosted by Kelly at Eclectically Vintage. Be sure to check out all of these stunning homes! If you’re coming from the last stop at Thoughts from Alice, wasn’t that beautiful? Welcome! I’m so happy you stopped by. 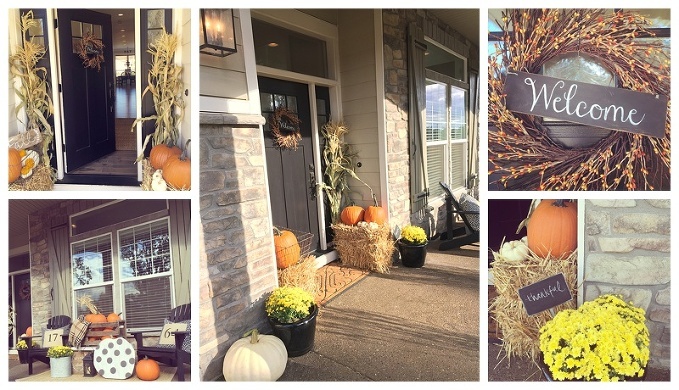 I’ve been looking forward to showing you my favorite things about fall decorating. The porch is a huge hint. Any guesses? You got it. To me, the best part of fall decor is in the simple things. Farmhouse style lends itself perfectly to this season, so it’s not about acquiring more stuff. It’s about featuring what’s going on all around us in nature, and, no surprise…for this farm girl it’s what was collected on a beautiful sunny day on the back country roads of my hometown in Oregon. So….come on in! Ok, you got me. I miiiiight have purchased this one thing. I found this “farmer’s market” sign a few weeks back, made by my sweet and talented friend Jolia at Farm Fresh Homestead (you can find her on Instagram @farmfreshhomestead). I just about dropped my purse when I saw this beauty. And I knew it would be the perfect “fall welcome” to our home, sitting atop this perfectly chippy dresser. This whole rustic vibe? My. Thing. Beauty found in imperfection. Yes. A quick stop in my office, just inside the front door…because this is what I’m talking about when it comes to fall decor. The rustic farmhouse pieces you already own totally set the stage for fall decor. One simple white pumpkin and a pretty fall bouquet…oh, hello fall. That was easy! A few simple swap-outs make this built-in area autumn-ready. Some wheat, a pumpkin, old books (always my fave), and a beautiful fall sign painted by my sister, Julie Oliveros (you can find her on Instagram @signsofserendipity). So go ahead, hang up your coat, and let’s continue! Oh, while you’re taking off your coat, I’ll just mention that the “Real Estate Bargains” chalkboard is a favorite vintage piece that I got at a garage sale years ago. I was trying to decide if I really “needed” it when I overheard a lady admire it. Ummmm, sold. Nothing makes up my mind faster than someone else wanting what’s in my hand! $5 well spent. Ohhhh well, just one more pic of this area. The closed cupboard doors conceal our kid’s “lockers”…a great place for backpacks, instruments, sweatshirts, etc. But let’s face it. Most of the aforementioned items are usually out on the bench for all to see every afternoon. But it was a great idea in theory. The kitchen island is always one of my favorite places to display a vignette of the season. Birch logs, white pumpkins, goose neck squash, and some beautiful hops, donated by Gayle Goschie, of Goschie Farms in Silverton, Oregon. If you’ve never seen a hop farm, it is a sight to behold. Row after row of these beauties, strung from the ground way up into the air. They have quite a distinctive odor when fresh, but after a few days and after they’ve dried, that dissipates. You’ll see them all over our home this year. They are just so pretty. I couldn’t stop. Ok, dining table. I’m always thinking about textures. Something living (the oregano plant, pumpkins), something wire, something rustic (uhhh, of course), something metal, something wood, something soft. Done. A little sunlight doesn’t hurt either. This combo sings to me. Like a reeeeeally good song. While we’re at the dining table, here’s a fun idea. I set this pumpkin out on Thanksgiving last year and had all of our family jot down what they were thankful for…it was a big hit, and everyone’s little notes were so sweet, I couldn’t bare to throw it away! Would you believe this has been sitting in my garage all year? Every time I see it, I smile. Question. Is there a rule about how long a home tour can be? Ok good. Because I’m not done yet. Need a snack break? I’m thinking a diet coke and a sleeve of ritz crackers sounds about perfect. Ya, I know, right? The crackers are not on my “healthy eating” plan, which makes them sound EVEN better. This chippy rustic sofa table holds my FAVORITE tray-type basket from HomeGoods, some cute little succulents (should be able to keep these guys alive, I mean, they’re drought-tolerant, right? ), and a few other little well-loved accessories from my stash. Simple. Rustic. Farmhouse. While we’re talking tables, let’s look at the coffee table. I got this galvanized tray at a sale for a few bucks months ago, and I intended to make a sign out of it. I might still do that, but for now, it makes a great coffee table tray. And my favorites reappear…white pumpkins and hops. So simple, so beautiful. These are some of the pumpkins I got to pick myself, thanks to Barbara Bauman at Bauman’s Farm in Gervais, Oregon. She and I took a fun little spur-of-the-moment farm- vehicle ride out to the pumpkin patch one sunny Saturday and picked the most beautiful white pumpkins you ever saw. Oh the memories. On the farm where I grew up, we had an “Apple Festival” on the 3rd weekend of October every year. Our little fruit stand would be jam-packed with families standing in line for our fresh apple cider, caramel apples, hay rides, and pumpkin painting contests. The whole family would work together to pull this day off…including friends, boyfriends, whoever was around at the time! And at the end of the day, when our muscles were so tired we could barely move, we’d get to order a pizza and sit around and talk about the day. What worked, what went wrong, how many times we had to drive that long trailer full of people around the farm while drinking in the glorious tractor fumes…priceless. All of it. And this. These hops are the crowning glory to my old hutch. I mean, stop it. So good. The mantel is the focal point of our home, and for sure my favorite thing to style. I was going for fresh, tonal, rustic, restful. Once again, texture plays a huge role. It’s all in the mix. And remix. And remix again. Until you get it just like you want it. I feel like this vignette sums me up. Everything I love. The humble. The time-worn. The weathered. With just a little sparkle. Carefully curated to evoke a casual, welcoming atmosphere. And memories. Lots of memories of life on the farm. Thank you so much for dropping by. Thanks for letting me share my farm-girl-cozy-fall home with you. I must admit, while preparing for this tour, a few times I started thinking about the AMAZING other women who will be on the tour. And then I started feeling inadequate. Because I’m just ME! Little Janna from Oregon! (My sisters and I always joke that when we go into nice stores we fear the salespeople will be able to see the imaginary Charlie Brown “PigPen” cloud of dust all around us…the dead giveaway that we are just farm girls, and have no business in “fancy” places! Hey, once a farm girl, always a farm girl!) Well, I think we women often do this to ourselves. Comparison is the stealer of joy, am I right? And it’s so foolish to compare. God gave us each unique giftings. 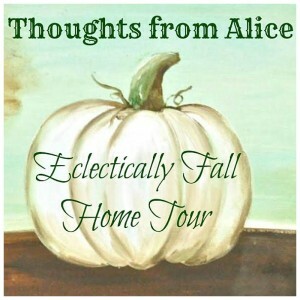 I’m so thrilled to be a part of Eclectically Vintage’s Fall Home Tour this year, and to present the “Yellow Prairie Interior Design” take on fall. Blessings to you, sweet friends! Bonus: a few little vignettes featuring hops. Because. They. Are. Just. So. Pretty. Be sure to hit the next stop on the tour tomorrow, Brooklyn Limestone. You won’t want to miss it! Good Housekeeping is featuring all of these homes this week so you’ll want to pop over there for lots more inspiration! Vanessa - Jana everything is GORGEOUS!!! So fun that we both have our fall tour up today and I truly do feel like I was invited inside your beautiful home and given the warmest of welcomes. You definitely have a gift! Jane - Oh, Janna—I’m simply in love with your home. So welcoming and pretty. I think you did a wonderful job with decorating for fall, subtle but creative. Love your writing style, too. You are candid and fun. By the way, I have the same rug you have in your family room! You definitely have a blog I want to follow! 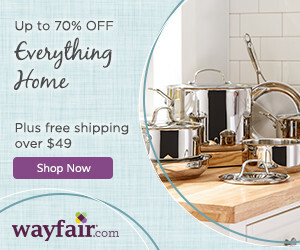 Lyndsey - Love your beautiful home! We just moved into a new house and I am starting to slowly transition our decor to a similar style. I have been on the hunt for the perfect counter height bar stools exactly like yours! Where did you find those? 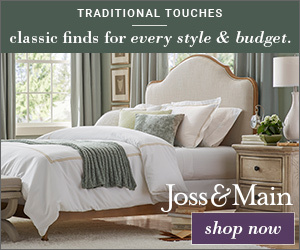 Lindsee - I love your blog and your beautiful home! We are in the market of purchasing our first home, and your stunning, clean, bright, whimsical, farm country deliciousness makes me so excited I can’t even see straight!! Blake - In love with your home decoration ideas. Thanks for showing it to us. Lisa Reagan - Hi Janna! 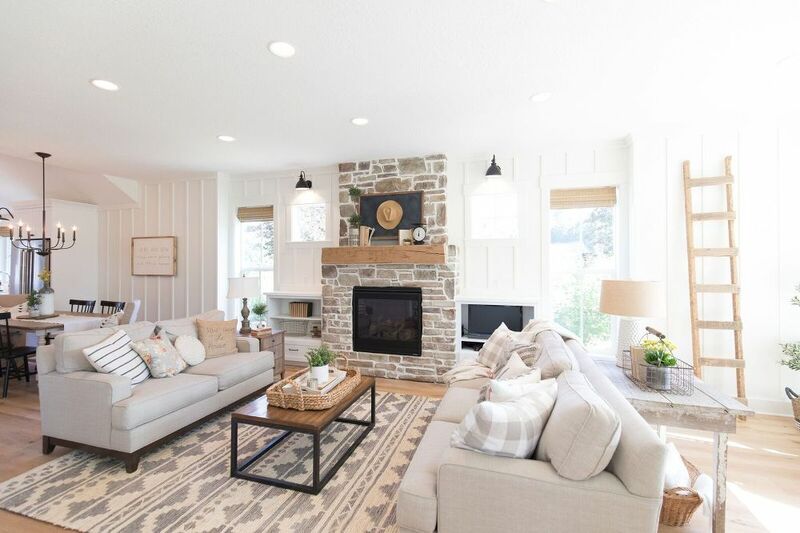 I have really enjoyed viewing photos of your home showing your great design style. I have one particular question regarding where you may have purchased the metal cylinder cage with the lid on top of your coffee table? My client pinned this photo and I’d love to emulate your style for her.